The Prairie Traveller. Routes to California and Oregon. 1859. A HAND-BOOK FOR OVERLAND EXPEDITIONS. WITH MAPS, ILLUSTRATIONS, AND ITINERARIES OF THE PRINCIPAL ROUTES BETWEEN THE MISSISSIPPI AND THE PACIFIC. PUBLISHED BY AUTHORITY OF THE WAR DEPARTMENT. MAP: Sketch of the Different Roads Embraced in the Itineraries. ROUTES TO CALIFORNIA AND OREGON. EMIGRANTS or others desiring to make the overland journey to the Pacific should bear in mind that there are several different routes which may be traveled with wagons, each having its advocates in persons directly or indirectly interested in attracting the tide of emigration and travel over them. Information concerning these routes coming from strangers living or owning property near them, from agents of steam-boats or railways, or from other persons connected with transportation companies, should be received with great caution, and never without corroborating evidence from disinterested sources. There is no doubt that each one of these roads has its advantages and disadvantages, but a judicious selection must depend chiefly upon the following considerations, namely, the locality from whence the individual is to take his departure, the season of the year when be desires to commence his journey, the character of his means of transportation, and the point upon the Pacific coast that be wishes to reach. Persons living in the Northeastern States can, with about equal facility and dispatch, reach the eastern terminus of any one of the routes they may select by means of public transport. And, as animals are much cheaper upon the frontier than in the Eastern States, they should purchase their teams at or near the point where the overland journey is to commence. Those living in the Northwestern States, having their own teams, and wishing to go to any point north of San Francisco, will of course make choice of the route which takes its departure from the Missouri River. Those who live in the middle Western States, having their own means of transportation, and going to any point upon the Pacific coast, should take one of the middle routes. Others, who reside in the extreme Southwest, and whose destination is south of San Francisco, should travel the southern road running through Texas, which is the only one practicable for comfortable winter travel. The grass upon a great portion of this route is green during the entire winter, and snow seldom covers it. This road leaves the Gulf coast at Powder-horn, on Matagorda Bay, which point is difficult of access by land from the north, but may be reached by steamers from New Orleans five times a week. There are stores at Powder-horn and Indianola where the traveler can obtain most of the articles necessary for his journey, but I would recommend him to supply himself before leaving New Orleans with every thing he requires with the exception of animals, which he will find cheaper in Texas. This road has received a large amount of travel since 1849, is well tracked and defined, and, excepting about twenty miles of "hog wallow prairie" near Powder-horn, it is an excellent road for carriages and wagons. It passes through a settled country for 250 miles, and within this section supplies can be had at reasonable rates. At Victoria and San Antonio many fine stores will be found, well supplied with large stocks of goods, embracing all the articles the traveler will require. 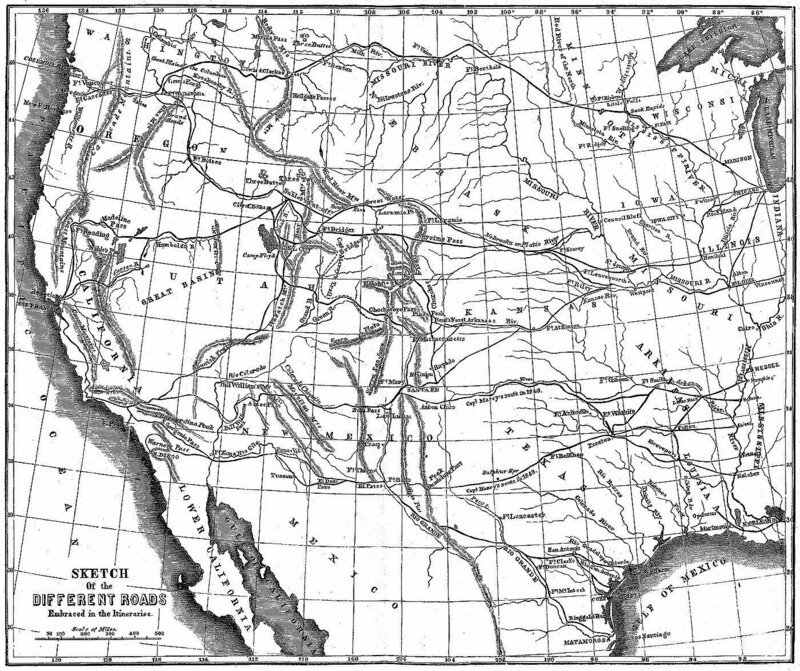 The next route to the north is that over which the semi-weekly mail to California passes, and which, for a great portion of the way to New Mexico, I traveled and recommended in 1849. This road leaves the Arkansas River at Fort Smith, to which point steamers run during the seasons of high water in the winter and spring. Supplies of all descriptions necessary for the overland journey may be procured at Fort Smith, or at Van Buren on the opposite side of the Arkansas. Horses and cattle are cheap here. The road, on leaving Fort Smith, passes through the Choctaw and Chickasaw country for 180 miles, then crosses Red River by ferry-boat at Preston, and runs through the border settlements of northern Texas for 150 miles, within which distances supplies may be procured at moderate prices. This road is accessible to persons desiring to make the entire journey with their own transportation from Tennessee or Mississippi, by crossing the Mississippi River at Memphis or Helena, passing Little Rock, and thence through Washington County, intersecting the road at Preston. It may also be reached by taking steamers up Red River to Shreveport or Jefferson, from either of which places there are roads running through a populated country, and intersecting the Fort Smith road near Preston. This road also unites with the San Antonio road at El Paso, and from that point they pass together over the mountains to Fort Yuma and to San Francisco in California. Another road leaves Fort Smith and runs up the south. side of the Canadian River to Santa Fé and Albuquerque in New Mexico. This route is set down upon most of the maps of the present day as having been discovered and explored by various persons, but my own name seems to have been carefully excluded from the list. Whether this omission has been intentional or not, I leave for the authors to determine. I shall merely remark that I had the command and entire direction of an expedition which in 1849 discovered, explored, located, and marked out this identical wagon road from Fort Smith, Arkansas, to Santa Fé, New Mexico, and that this road, for the greater portion of the distance, is the same that has been since recommended for a Pacific railway. This road, near Albuquerque, unites with Captain Whipple's and Lieutenant Beall's roads to California. Another road, which takes its departure from Fort Smith and passes through the Cherokee country, is called the "Cherokee Trail." It crosses Grand River at Fort Gibson, and runs a little north of west to the Verdigris River, thence up the valley of this stream on the north side for 80 miles, when it crosses the river, and, taking a northwest course, strikes the Arkansas River near old Fort Mann, on the Santa Fé trace; thence it passes near the base of Pike's Peak, and follows down Cherry Creek from its source to its confluence with the South Platte, and from thence over the mountains into Utah, and on to California via Fort Bridger and Salt Lake City. For persons who desire to go from the Southern States to the gold diggings in the vicinity of Cherry Creek, this route is shorter by some 300 miles than that from Fort Smith via Fort Leavenworth. It is said to be an excellent road, and well supplied with the requisites for encamping. It has been traveled by large parties of California emigrants for several years, and is well tracked and defined. The grass upon all the roads leaving Fort Smith is sufficiently advanced to afford sustenance to animals by the first of April, and from this time until winter sets in it is abundant. The next route on the north leaves the Missouri River at Westport, Leavenworth City, Atcheson, or from other towns above, between either of which points and St. Louis steamers ply during the entire summer season. The necessary outfit of supplies can always be procured at any of the starting-points on the Missouri River at moderate rates. This is the great emigrant route from Missouri to California and Oregon, over which so many thousands have traveled within the past few years. The track is broad, well worn, and can not be mistaken. It has received the major part of the Mormon emigration, and was traversed by the army in its march to Utah in 1857. At the point where this road crosses the South Platte River, Lieutenant Bryan's road branches off to the left, leading through Bridger's Pass, and thence to Fort Bridger. The Fort Kearney route to the gold region near Pike's Peak also leaves the emigrant road at this place and runs up the South Platte. From Fort Bridger there are two roads that may be traveled with wagons in the direction of California; one passing Salt Lake City, and the other running down Bear River to Soda Springs, intersecting the Salt Lake City road at the City of Rocks. Near Soda Springs the Oregon road turns to the right, passing Fort Hall, and thence down Snake River to Fort Wallah-Wallah. Unless travelers have business in Salt Lake Valley, I would advise them to take the Bear River route, as it is much shorter, and better in every respect. The road, on leaving the Missouri River, passes for 150 miles through a settled country where grain can be purchased cheap, and there are several stores in this section where most of the articles required by travelers can be obtained. Many persons who have bad much experience in prairie traveling prefer leaving the Missouri River in March or April, and feeding grain to their animals until the new grass appears. The roads become muddy and heavy after the spring rains set in, and by starting out early the worst part of the road will be passed over before the ground becomes wet and soft. This plan, however, should never be attempted unless the animals are well supplied with grain, and kept in good condition. They will eat the old grass in the spring, but it does not, in this climate, as in Utah and New Mexico, afford them sufficient sustenance. The grass, after the 1st of May, is good and abundant upon this road as far as the South Pass, from whence there is a section of about 50 miles where it is scarce ; there is also a scarcity upon the desert beyond the sink of the Humboldt. As large numbers of cattle pass over the road annually, they soon consume all the grass in these barren localities, and such as pass late in the season are likely to suffer greatly, and oftentimes perish from starvation. When I came over the road in August, 1858, 1 seldom found myself out of sight of dead cattle for 500 miles along the road, and this was an unusually favorable year for grass, and before the main body of animals had passed for that season. Upon the head of the Sweetwater River, and west of the South Pass, alkaline springs are met with, which are exceedingly poisonous to cattle and horses. They can readily be detected by the yellowish-red color of the grass growing around them. Animals should never be allowed to graze near them or to drink the water.